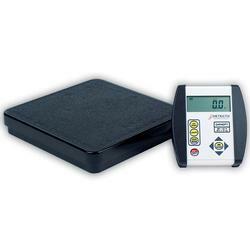 Detecto's reliable DR400-750 digital physician scale is lightweight and portable, making it perfect for mobile clinics, home care nurses, or wherever a portable scale with Body Mass Index is needed. The remote digital indicator comes with a wall-mount bracket and easily mounts on a counter top or wall. The indicator features large 0.75 high digits in an LCD display, selectable units, Body Mass Index and a Lock/Release key for holding weight after a patient has stepped away from the scale. The 750 quickly calculates Body Mass Index by simply entering the patient's height while weighing. The DR400-750 is battery powered, so you can take the scale anywhere you need it. The unit has a slip-resistant mat to ensure patient safety when getting on and off the scale. Power: 6 "AA" size batteries or optional AC adapter.